Excellent value. Sea view,spacious room and lovely,varied breakfast included. Hotel is above a beautiful rocky bay with steps down to the beach. Cliff paths in both directions to Platja d'aro and Calonge, very picturesque. Safe parking altho' €6 a day. Lots of places to visit in the area. Easter but not really busy altho' breakfast room a little hectic. Ate elsewhere as cheaper but menu looked interesting. 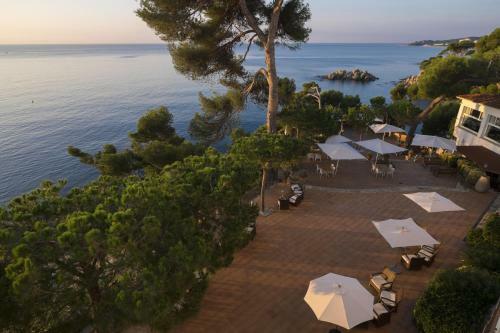 Overlooking the Costa Brava headland of Cap Roig, the Silken Park San Jorge offers direct access to the Bella Dona and Sant Jordi Coves. It features an outdoor pool, a spa and a free Wi-Fi throughout. 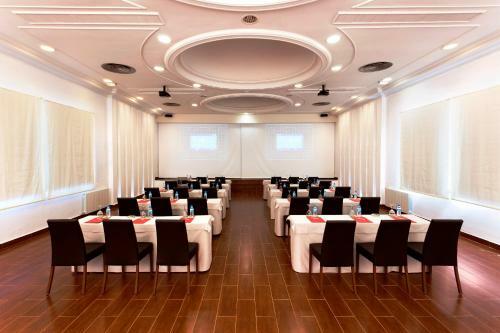 The air-conditioned rooms at the Silken Park Hotel San Jorge feature plenty of natural light. They all include a safe, an LCD satellite TV and a minibar. Silken San Jorge’s restaurant serves gourmet Catalan cuisine, and the Mar Blau café serves drinks and snacks on its terrace overlooking the sea. 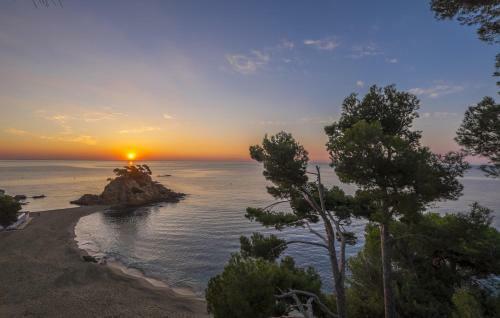 The bars and restaurants of Platja d’Aro are just a 15-minute walk away. 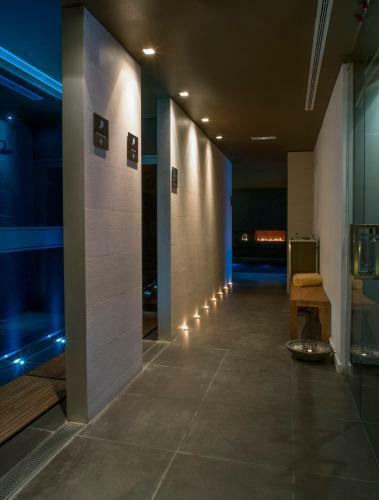 The Silken spa has a small hydro-massage pool, a sauna, a hammam (public bath), a shower circuit and treatment rooms. There is also an outdoor summer area with a hot tub. its by far the best place i've been in Spain. Es muy bonita! The sea view is simply superb and the beach is really beautiful. The private beach makes it more exclusive. It is located a little far from the terminal, for those using public transport but still its manageable once you grab a taxi. That was one of my best trip ever - hot April with sea-view from room and excellent service. Thank you! Too reasonable a price to be picky! £300 for 2 with sea view at Easter including breakfast for 4 nights. Thank you, Booking.com. Rather too busy for our likes; always a stampde at breakfast time! Great price very good staff good breakfast and fantastic location. Pool needed cleaning although understandable as it was very early in the season. Location wonderful coastline and beaches...hotel quiet and typically old style Spanish which was very pleasant. Evening meal very good quality. A few minutes from some great shops and restaurants. Bar staff very nice and welcoming. Booked initially a standard room and upon arrival when we were shown a laminated sheet explaining this was for a room overlooking the carpark and not the sea as we thought we had booked...a supplement of €15.00 was charged to upgrade...nothing mentioned in the online booking process and I was slightly put out by this. As it was, the room was comfortable but very small, I would have loved to see the room we initially booked !? Maitre D in the restaurant needs to lighten up as I feel he has had a charisma bypass !! The room is not a four star standard; rather three star. But it is well maintained, clean, spacy enough and very comfortable. And in fact very good value for money. The hotel is absolutely beautifully situated, on a cliff, with large terraces adjacent the Mediterranean Sea, with stunning views. You can walk down to two small coves with picturesque sandy beaches. It is close to Platje d'Arro, but it is very quiet and really feels like an "outside hotel".The hotel has a large outdoor swimming pool, but also a very nice indoor one and a spa. The kitchen is great and also good value for money. The personnel is very friendly and attentive. We left at five in the morning the last day and got two excellent and extensive breakfasts for on the go. Service is generally great and the whole feeling is of a much higher ranked hotel. We will most certainly come back here soon. The staff was very friendly and help full. We will come here again. The SPA was a bit small. Amazing views, beautiful decor, lovely outside seating area, plenty of space, extremely relaxing, private beach was stunning, short walk into resort centre to have lunch on the sea front - loved our stay! Nice hotel with friendly staff. Excellent kitchen and very good breakfast. Beatiful view over the sea. Wonderful sea views. Excellent Food. Caring Staff. Rooms very clean. Will certainly return. Could be difficult if you have problems with walking as there are steps on all levels of accommodation. Would be necessary to request rooms at ground level. Breakfast was good but cooked items were nearly cold. We were there four 4 nights in mid-March. Beautiful location set apart from the town which looks wall to wall touristy. The food was great and service in the restaurant was excellent. I am sure in the high season it is a different story as the place was very un-crowded and moving between the many lovely places to sit and read or have coffee and look out at the sea was very easy. We arrived on Sunday afternoon by bus and got out at the 2nd Platja stop where there was a taxi stand. Unfortunately there were no taxis and we called the hotel and they did not seem to want to help. We called the taxi number - no answer. Finally after over an hour we called the hotel back and pushed them to help and they got us a taxi in 10 minutes. Why they didn't do this before I have no idea. The 2km ride cost 9 Euros but we were just glad to get there. All went well after that. We had a very nice time here and the staff were friendly and helpful. Having to leave so soon!! The place is quiet, perfect if you need to relax. Nice views !!! We went in February we don't have a car so we had to walk to get to the center ,30 min every night. we were offered this hotel after the last one I booked for our honeymoon informed Booking .Com - the day before our wedding - that they were shut!!! can you imagine the shock, anyway, we ended up here and WOW...amazing. The view of the sea when you walk through the entrance. Its beautiful. they actually did us a favour by cancelling the last hotel as this was by far the better one. The location was perfect and the private beach was just stunning and the perfect honeymoon location. Our room with sea view- had exactly that...lovely big, clean ,comfortable room, amazing views and quiet. The staff - amazing - they sent a bottle of champagne to our room when they found out it was our honeymoon with a lovely hand written note - so sweet. Then when my husband promptly went on to then spill the said champers on to his laptop :0) they were very helpful in the clean up after - what stars ( and we saved the laptop)The breakfast bar in the morning - astonishingly good and as much as you can eat. The restaurant in the evening - fantastic quality dining and beautiful flavours. The spa facility's were gorgeous and we had a two spa circuit sessions to relax - highly recommended... EVERYTHING about this hotel including ALL staff (housekeeping as well) we could not fault and we want to say a big THANKYOU for our unforgettable honeymoon to Silken Park Hotel...incredible stay and highly recommended. All the staff were so helpful and very pleasant. Thank you for everything, there was nothing to dislike. The hotel was not full and for the same price they gave me a room with sea view. Very clean and beautifull view. fantastic hotel! cannot fault it from comfort, location, rooms with marvellous view, gardens, breakfast... More than anything I am most grateful to the receptionists (one in particular) who helped me to solve my problems and very kindly spent a lot of time (more than 1 hour twice) trying to sort out what could be done as I was in a difficult (and unexpected) situation. The location is wonderful and the hotel is nice. The breakfast buffet is large with lots of options. I ordered room service one evening and the food arrived very quickly (in 15 minutes)! Friendly staff. The 20 Euro per day pet fee was excessive (and not advertised). The evening meal in the restaurant is only ok...nothing special. The rooms are not soundproofed--you can really hear your neighbors. All! What a view! What a spa! What a breakfast! Hotel next to the sea. Breakfast is very good with variety of food. Stayed in room 122 and the sea view was not very nice. In the comments I had asked them to give a nice room as it was my boyfriend's birthday. ( Note that the hotel wasn't very full) Seems like they don't read the comments or they just don't care. Brillaint location. 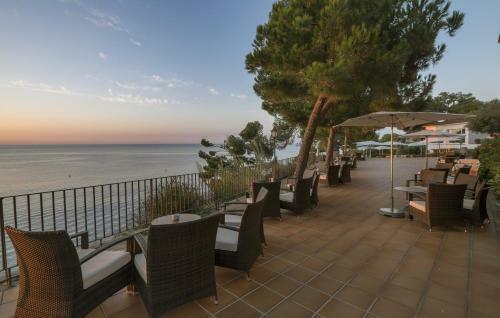 Close to Platja d'Aro but with a degree of privacy. Superbly helpful staff, great breakfast choice and quality meal in restaurant. Great value. Amazing location, spectacular sea views, direct access to beach. Smoking neighbors, we could not enjoy the balcony. It's difficult to fault this hotel - we had a superior sea-view room and the views are spectacular at all times of the day. The staff are helpful, unobtrusive, and efficient, and the restaurant runs like clockwork. We stayed on half-board basis and there was plenty of choice without having to pay extra supplements. The breakfast buffet was probably the best we have come across in Spain, and compares favourably to The Paradores. We shall definitely stay there again. The Setting of the Hotel is absolutely stunning. The common spaces of the hotel, lounge, bar and outside terraces are very comfy and invite to relax and enjoy the seaview. However there are a few small things, that could be better, but those are details. We enjoyed our stay, but if we had to pay the full price we would have been a little disappointed with those small things. We were there with a special 30% off offer. Great hotel and excellent value for money Location superb and the staff are helpful, friendly and polite. Sea view room was wonderful. Restaurant excellent and a fantastic buffet breakfast. Would have liked a few more festive decorations for Christmas but other than that, can't fault it. Location and beach were lovely. Very good breakfast and dinner. Great room overlooking the sea. Sort of bizarre that no one asked if they could help with the luggage. I concur with other comments about having to pay extra for parking, especially in the very low season. I think there were only about five other couples in the whole hotel while we were there. We enjoyed the standard of service and the quality of food in the restaurant. It was good to have a proper restaurant service rather than the usual buffet style evening meal. The location was stunning and we enjoyed the view from our balcony. Our stay represented excellent value for money. The cost of parking at 10€ per day for a beach side hotel is surprising . One can park just outside the hotel for free. The views from the rooms are really spectacular and the breakfast is so good. The spa is a really nice extra. Overall it was a great stay and a hotel I would recommend to everybody. Everything: the views of the beach , the big beds, the central heating with good temperature, very good breakfeast with a lot of fruit. Reataurant, food and attention were great. Situation. They left food and bowl for my dog. the Hotel has a stunning location, with sea views from most rooms - the staff are very friendly and the food served in the restaurant excellent. i feel the EUR 10 a day charge for parking is too expensive. i did not use when you can park nearby for free. The breakfast buffet, the fabulous rooms, sea views and beaches, the well-tended grounds, the friendly and efficient staff and the food. Staff were extremely helpful and spoke excellent English. The room was very good and generally well maintained. Housekeeping was faultless. Breakfast was very good with plenty of choice and of a high standard. Public areas were comfortable and airy and outside was calm and relaxed. Easy access to a nice secluded beach. Room - minor point only, the shower lacked water pressure. General - 10Euros/day car parking! Really?! For a 4* hotel I would expect this to be included. a very good kitchen, very nice dressed plates and tasteful, while the restaurant looks a little bit tired. We liked the whole experience.staff were brilliant and the breakfasts are just fabulous. great food every day lunch and dinner. hotel was packed but it was nice and quiet too, i could have stayed a few more days.really good value . We loved the location, the view from our room was superb, the walks on the cliff top were great and the swimming pool, dining room and bar area were all you could wish for. The staff were very helpful particularly with telling us where to go. Pals and Peratallada were well worth a visit. The same menu every night but we ate our way through it. It didn't really matter as everything else was so good. The service was unbelievable, starting from the receptionists, waiter and house keeping. It's very clear that the staff are doing all they can for u to have a great stay. I loved the location right on the sea, it was magical. The breakfast included in the tariff was a nice value add, where many hotels are not including this and charging significantly more. Staff were very accommodating and friendly offering a greeting each morning, despite having hands full of plates clearing breakfast areas etc... The breakfast view was beautiful. We had 3 nights in a room and then a final night overlooking the sea which was absolutely beautiful. The first room was significantly dark and may have easily been made a bit brighter though a piece of colourful art on a big bare white wall. (A minor point, but just a comment). Value for money for meals in house was disappointing, to say the least, I ordered a Caesar Salad at a cost of 12 Euro (from memory) which could have been placed on a saucer, it was that small. It had no egg, no anchovies, nor bacon, it comprised of a few leaves of lettuce, a few cherry tomatoes cut in half, a few croutons and some chicken pieces which amounted to a lousy serve, and a disappointing lunch experience for a big price. Not to far away from center. Good location regarding the sea. Good view from room. Hotel should provide the umbrellas and chaise long at the beach rather than having to pay each time you use it. We had a wonderful week, and would highly recommend this hotel to anyone. It was 100% relaxing, and all the staff were very helpful and friendly. The food was without exception delicious, and although the restaurant wasn't cheap, it was good value for money, and we were pleasantly surprised by our final bill - quite a bit less than we had been prepared for. A delightful location in a cove looking out to sea, with a large pool, and two very easily accessible beaches (as long as you are able to walk down steps, so sadly probably not any good for the less able bodied). You wouldn't believe driving through Platja d'Aro that you were about to come to such a lovely place! And as another reviewer said, you only get a glimpse of the high rise buildings of the town, from a few spots - most of the time you wouldn't know they were there at all. We did find that we often had to wait quite a while for the waiter/waitress to bring our drinks, but that would be my only complaint. Hotel is perfectly located - just outside of town and still within walking distance. 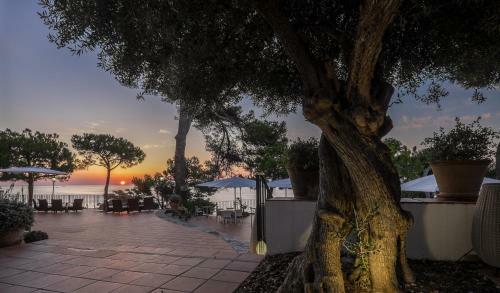 The hotel itself is beautifully built with several teraces overlooking the Mediteranean Sea. Food was excellent. Suite we stayed in was FANTASTIC. Restaurant on the beach was awesome, food great and prices reasonable. Working hours for the pool/spa/towel service. Cannot get one before 10:00 A.M. If you have half-board, keep in mind that dinner is served indoors. If you like dining outside, do not take half-board. Beautiful location on the coast. Comfortable spacious room. Relaxed luxurious atmosphere. Didn't realise we had booked a room without a balcony. Really disappointed not to have one. Not crazy about nearby platja d'aro - other nearby towns much nicer. Seaside view room actually view to the outside restaurant tables, which is braking all intimacy on the balcony. The staff were friendly and most helpful when things needed fixing. The two cove beaches below the hotel are lovely. The outside cocktail area. We had issues with both the rooms we were in - noisy lift shaft and broken aircon but the staff compensated for this. The breakfast buffet is poor and laid out dreadfully to the point of danger. We started going just before it finished for safety. I liked everything - good location, great view, friendly staff willing to help, good food, spa. It has little closed beach in a very beautiful place.